What is the default login for Raspbian? How to switch the console to HDMI? How to change the console font? How to switch the Desktop (X-Window-System) to HDMI? How to mirror/copy the HDMI output to the display? How to switch the backlight on/off? How to set or disable the blanking/screensaver time? How to emulate a right mouse button under X-Window-System? Where can I found an on-screen keyboard? I only see the top left part of a program window/dialog? The display stays black/white (no output)? Does the display work with Windows 10 IoT? Does the display work with Raspbmc/OSMC? Does the display work with Kali Linux? How to install and run RetroPie on the display? How to install and run Quake 3 on the display? How to install and run SqueezePlay on the display? Can I use the RPi-Display together with a HiFiBerry? How is the display and touch controller connected to the RPi? Where can I find the schematics of the RPi-Display? What is the optional switch on the RPi-Display for Raspberry Pi Model A and B? How are the tactile switches connected on the RPi-Display B+? How to connect the GPIO-Adapter for RPi-Display B+? How to flash/update the ID EEPROM? The default login for Raspbian is username pi with password raspberry. Note: The standard keyboard layout is English and so Y and Z are swapped on German keyboards. Run $ con2fbmap 1 0 and to switch back to the display $ con2fbmap 1 1. The font can be changed with console-setup or edit the file /etc/default/console-setup. This can be done with fbcp. Further infos can be found here. To force HDMI output to a resolution of 320x240, add the following lines to /boot/config.txt. The display backlight can be turned on/off and can also be dimmed (using PWM). Please note when the display shows the same content over several hours then the image can burn into the screen. Further infos can be found here. Most programs are not designed for a small screen (<640x480) and so you see only a part of the window. It is possible to scale the screen with fbcp, but the best practice is to create an user interface specially for the display. This can be done for example with Pygame or Tkinter (example). If the display is black and the backlight is also off then the FBTFT driver is not installed or loaded correctly. If the backlight goes on and the display stays black or white then check if the FFC connector is correctly closed. 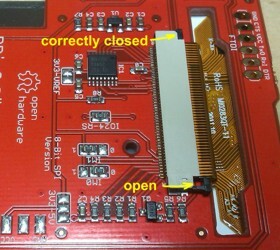 When using a flex cable for the connection (RPi-Display Flex Edition) then the jumpers MISO, MOSI and SCK have to be closed. On other problems please check your SD-Card and power supply. If you want to use the touchscreen with Pygame, you need the latest Debian Wheezy image. In Debian Jessie the SDL version has changes which causes weird behavior when using the touchscreen with Pygame. See the Adafruit Bugreport and the Debian Upstream Bugreport for more information. A simple guide how to install all necessary bits to use the display with Pygame can be found in the PDU1800 Wiki. We have not tested it yet, but there are already projects available for the ILI9341 display controller and ADS7846/TSC2046 touch controller from Graham Chow and Peter Oakes . Yes, the FBTFT framebuffer can be installed on Raspbmc/OSMC and the HDMI output can be mirrored to the display using fbcp. Yes, the FBTFT framebuffer can be installed on Kali Linux. Pre-built images for the Raspberry Pi can be found here. You can use the RetroPie SD card images or you can install RetroPie on an existing system. If you use the SD card image with RetroPie, then you can skip the last two installation steps. Install Quake: English Guide, German Guide and then reboot the system. Yes, it is possible to use a RPi-Display B+ and HiFiBerry together. But the backlight control signal of the display has to be changed from GPIO18 to GPIO12 (BL jumper), because GPIO18 is used by the HiFiBerry. Note, the automatic HAT detection will not work, if both ID EEPROMs are connected to the Raspberry Pi. Further infos (e.g. ghost images, screen burn-in) about displays can be found here. Our MI0283QT-Adapter v1.5 can be connected in the same way, when it is set to 8-Bit SPI: Jumper IM0=0, Jumper IM1=1, Jumper BUSY-RS=RS/DC on pin 12. The schematics and layout files can be found here. The .brd and .sch files are in the CadSoft/Autodesk Eagle format. There are pads for an optional tactile switch or VT93N1 LDR sensor (Light-Dependent-Resistor) on the PCB with a connection to GPIO22 of the Raspberry Pi. How to read the pin state? The FFC connectors have top contacts and so the FFC cable contacts have to be aligned to the top. If you want to connect the display via the FFC cable then have a look here and the jumpers MISO, MOSI and SCK have to be also closed. The EEPROM on the RPi-Display for Raspberry Pi Model B+ can be updated as follows. Before the update the WP jumper next to the EEPROM has to be closed. Note: For a Device Tree Kernel add to /boot/config.txt the following line before flashing: dtparam=i2c0=on (before any dtoverlay statement). The display can be controlled via 8-Bit or 9-Bit SPI. Note: FBTFT has currently no DMA support for 9-Bit SPI.